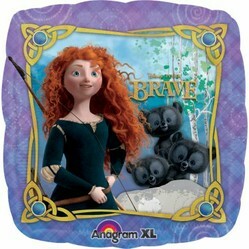 If you're planning a birthday party with a theme based on the Disney Pixar movie Brave, you've come to the right place! Work with officially licensed Brave party supplies or develop your own ideas for a great birthday party theme. Elements to consider using include stone walls like the castle Merida lives in, archery items like targets and a black horse like Angus. Include the forest she hunts in and Scottish images for a unique event. Official Brave party supplies are starting to arrive, but this is still a serious work in progress as new ideas come to me. Official designs for invitations and thank you notes from the Brave birthday party supplies. I also found some cute Merida invitations over at Etsy. Not officially licensed, so not sure how long they can get away with them. So - When's the party? In the next month or two. I've got plenty of time. You plan parties? I thought they just happened! Good luck with the party planning! I'm sure it'll be fabulous. Grab a party pack with officially licensed Brave party supplies to get you started with your Brave party. The packs come with everything you need for eight to 16 guests, including plates and decorations. But if you want to create something a little different? Given that the audience most likely to want a Brave birthday party would be tween girls - 8-12 years old, likely - we don't necessarily have to have character plates to make it a Brave party. They're pretty good at using their imaginations. 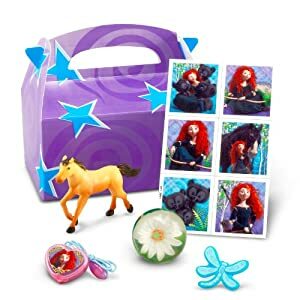 If you want to stick with standard party supplies, colors can be whatever your child wants, although I'd suggest green, blue, gold and red to follow the colors of Merida herself. Includes (8) paper themed square dinner plates. This is an officially licensed Disney Brave product. Includes (8) square paper dessert plates that are 7" wide. This is an officially licensed Disney Brave product. Includes (8) themed paper 9 oz. cups. This is an officially licensed Disney Brave product. Includes (16) lunch napkins. This is an officially licensed Disney Brave product. We have a few different settings in the movie that would contribute to ideas for decorating for your Brave birthday party. You could pick just one or choose a variety to create stations around the party area. First of course is the castle where Merida and her family live. The pictures I've seen so far make it seem like your typical gray stone castle and there aren't a lot of decorations around to break it up. The second obvious idea is the archery competition, which is an outside venue. There are tents set up for vendors and a seating area for the royal family. All of that is easily replicated and would work well if you wanted to do a full-on Highland games activity. Includes (1) themed plastic tablecover. Measures 54" x 102". This is an officially licensed Disney Brave product. It doesn't seem like a birthday party without cake, right? Cake the way we do it isn't exactly period appropriate, but who cares! Check out the edible cake images below from Brave, as well as cup cake toppers, candles and cupcake rings. For now, let's think of some ideas you can use without all that. Cake shaped like Angus, Merida's black horse - although black frosting can do a number on your teeth! Scottish shortbread cookies instead of cake! For the rest of the food, you could do a full meal. Ever been to Medieval Times? No silverware! The menu there consists of cornish hen, roasted potatoes, soup - all of which can be downed without forks or spoons. If you have your heart set on cupcakes, consider making your own cupcake toppers for them, the kind that stick into the top of the cupcake. A friend of mine has complete directions at that link and I found bottlecap stickers to use at Etsy. You could also use the Brave figures in the playset pictured here either on a big cake or one per cupcake. This proud pony will spur you on to create the perfect party cake. He’s a sure bet for birthdays, race day parties and school celebrations. Bake your favorite cakes in this heavy gauge tinplated steel horse mold. 14 inches in length with a 6 cup capacity. Made in Portugal. Use this set of 6 pans to make horse shaped small cakes and muffins. Made of sturdy tinplate steel. 4.5 inches long by 2 inches wide. Made in Portugal. Maybe You'd Prefer Brave Cupcakes? Some ideas to get you going in planning stuff to do! There are several different locations we see Merida in during the movie Brave. You could use those scenes as stations for the party to organize activities. Or maybe do the activities! Here are a few of the thoughts I had about what to do at a Brave party. Archery instruction - Merida's skill is a crucial part of the plot. Maybe your girls would like to have the party at an archery range and get some instruction in the sport. Or you could check into having an instructor come to the house. Benefit of providing safety training along with the fun. "Archery" tournament - The targets are easy to come by. You could have a tournament throwing/shooting things other than arrows. Organize a hunt to find Mordu. Plan it out like a scavenger or treasure hunt. 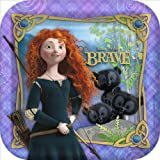 Brave coloring books - Great option for some quiet time with younger kids. Camo compound 39 fiberglass bow that comes with three 18 suction cupped arrows and a 4 color target. Includes: a sticker sheet, lipgloss necklace, horse figurine, assorted dragonfly ring and an assorted flower bounce ball. Nothing is more fun than watching your children pretend they are Robin Hood saving the fair maid Marian! This Bow & Arrow Set is perfect for any aspiring little archer! Includes (2) themed tattoo sheets. This is a licensed Disney Brave product. Includes (8) themed treat bags. This is an officially licensed Disney Brave product. Includes (4) themed lipgloss necklaces. This is an officially licensed Disney Brave product. Share Your Brave Birthday Party Ideas!